In order to be a competent parent, we must constantly watch over the safety of our children. Most of the time, this is easier said than done for danger seems to lurk everywhere. Of course, in order to be successful in protecting our children, we need to be aware of what dangers are present in every situation as well as what to do in case something bad were to happen. We also must be knowledgeable and not believe information that is just hearsay or incorrect in the first place. Sounds like a very daunting task, doesn't it? Well, now there's a company called One Source Global Inc. who's set out to make family safety FUN! They've created a board game called "Play It Safe", which I had the opportunity to review. Keep reading to find out more about the game that just might save your life! I reviewed the Play It Safe Board Game from One Source Global Inc., which retails for $34.95, but is currently on sale for $29.95. The Play It Safe board game has a very lofty mission: to prevent the leading cause of death and disability for kids ages 1 to 14, which is preventable childhood injury. Now, your family can increase their knowledge and prepare for everyday dangers while having a fun game night. I thought this was a very nice addition to the Play It Safe game and one that I will begin using with my family right away. It's also nice to know that the Play It Safe website includes a special ID form to help create the wallet-sized ID cards for your children. This is completely free to download and I highly recommend making one of these for everyone in your family! 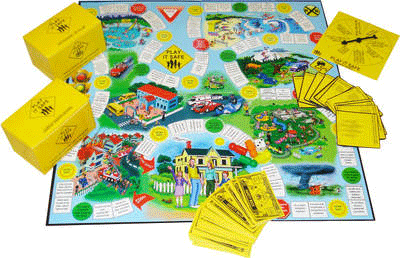 The Play It Safe game contains 4 game pieces, two sets of question cards (300 adult questions and 300 children questions), safety bucks, game board and a winner's spinner wheel. The object of the game is simple: the person to collect the most safety bucks is the winner. Collecting safety bucks can be accomplished in a few different ways. First, if you land on a green light space on the game board, you will automatically receive a safety buck. Next, if you land on a yellow light space AND answer your safety question correctly, you will automatically receive two safety bucks. Finally, if you answer any safety question correctly, you will receive one safety buck too. This last point I am assuming, since I read the instruction guide over and over and never did it say that you are supposed to receive a safety buck for answering a question correctly. I'm fairly sure that this is just an oversight in the way the directions were written though. 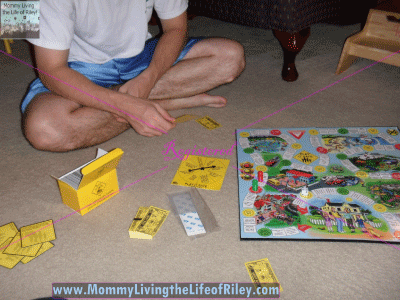 Michael and I set out to play this game and have to admit that we weren't as safety savvy as we thought we would be! I only got a few cards completely right the entire game! If it weren't for the green and yellow spaces on the board, I wouldn't have had many safety bucks at all. I do think that the questions in the adult box could use a little improvement though. Q: When riding a bicycle, what can you do to drastically reduce your chances of getting hit by a car? Well, I thought the answer just had to be "c. Ride on sidewalks and crosswalks". Kind of hard to be hit by a car if you're on the sidewalk right? As a matter of fact, I've lived 34 years on this planet and have never once seen a car driving on a sidewalk. But that wasn't the answer. Michael thought the answer had to be "d. Ride in the opposite direction of traffic", since you won't be hit as easily if you can actually see the vehicles coming toward you. 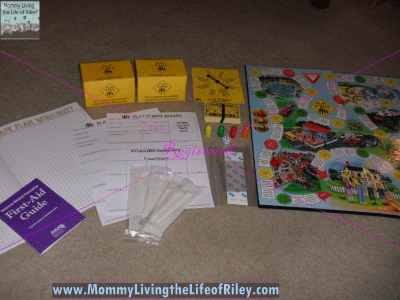 If you are looking for a fun and exciting way to talk to your children about safety, then I think you should definitely check out the Play It Safe board game. No child likes to be lectured about safety and this is a unique way to make the dialogue much more natural and a great way for everyone to learn something new in the process. I also love how Play It Safe took it a step further and included all of the wonderful family safety items which are not actually needed to play the game. This is more than just a board game, it's a one-stop shop for everything needed to keep your family happy and safe this holiday season! Disclosure: I received the Play It Safe Board Game from One Source Global Inc. and Family Review Network in order to facilitate my review. No other compensation was received. This product review is based on my own personal experiences with this item and is completely honest and objective. LOL! Well, maybe the cards did know best after all and bike riders ARE supposed to stay off the sidewalks! :) Have a great day!